Question: Can a woman take from her husband's wealth to pay Zakatul-Fitr if he is not willing to pay it? Fatwa: All perfect praise be to Allah, The Lord of the Worlds. I testify that there is none worthy of worship except Allah, and that Muhammad is His slave and Messenger. to take it from his money without his knowledge and pay the Zakatul-Fitr. hence one cannot pay it on his behalf except with his permission as is the case of Zakat. Nonetheless, if the wife pays Zakatul-Fitr from her own money, then this is better for her since some scholars are of the opinion that the wife is obliged to pay Zakatul-Fitr from her own money and not from her husband's money. The wife should urge her husband to pay Zakatul-Fitr as it is a religious obligation and he is sinful if he does not pay it. 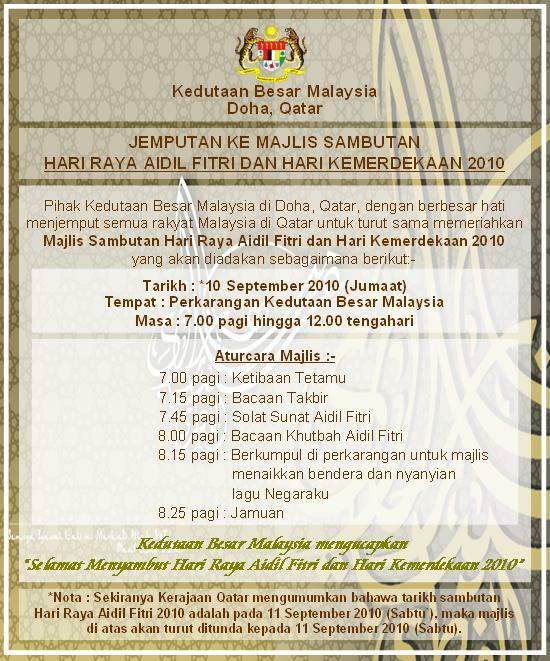 Finally, Zakatul-Fitr is purification for the shortcomings one had during fasting. We are happy to announce that RasGas is hosting its Annual Family Day Celebration on the 2nd day of Eid Al-Fitr 2010 at the Sheraton Hotel, Doha. Activities: Face painting, jumping castles (for different ages), popcorn and candy floss machines, henna artists, nail art for girls, walking magic show, fabric and face painting, balloon twister, life size cartoon characters, game stalls and lots more. The venue can be accessed from the side door close to the conference centre and sufficient parking will be availability. Please ensure that you bring your RasGas ID card with you. Kindly note that entrance is restricted to RasGas employees and their immediate family members only. We regret that friends and extended family members are not allowed and entry will be refused. A bus schedule will be sent to you shortly via a separate communication from the Transport section. We hope to see you all and we wish you a happy and safe holiday. Peringatan, jemputan iftar terakhir Ramadhan 1431H oleh Al Khor Community. 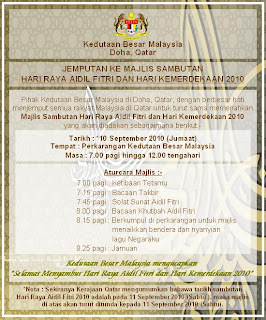 Peringatan ke-2, sedikit jamuan sarapan pagi raya pertama Aidilfitri oleh Al Khor Community. Selamat hari raya Aidilfitri Maaf Zahir dan Batin. !!! Dear Residents a reminder for the 4th Community IFTAR Buffet on Tuesday 7th of September!!!! All community Muslims are cordially invited to attend the Tuesdays traditional Iftar Buffet after Maghreb in Al Waha Club. and men may proceed to the tent we have setup in the back of the Club. Community Eid breakfast on the 1st Day of Eid Al Fitr at the tent behind Al Waha Club from 7:00am to 10:00am. Due to large numbers anticipated, please be careful while parking your car in any of the available parking spaces around the club.